The United Print Media Group (UPMG), the premier association of major publication companies, with more than 100 titles of major newspapers, tabloids and magazines in the country will once again spearhead its flagship project, Tinta Awards. The UPMG Tinta Awards, now on its 6th edition is the first Philippine press award-giving body geared toward recognizing excellence in print advertising. Its aim is to encourage creativity in print and to keep the spirit of print media alive in an increasingly digital terrain. The event gives due recognition to the creativity and excellence of Philippine print advertising practitioners. The 6th Tinta Awards has categories ranging from consumer and public service print advertising, interactive and integrated print campaign, special print media execution to online advertising campaign and print craft. This year’s competition shall also recognize creativity in magazine and newspaper layout and design, and special supplements. There is also a student category, which seeks to “attract new generation readers among the youth” through print media’s communication campaigns. The contest is open to all Philippine-based advertising agencies, digital agencies, media independents, print media publishers and printing companies, advertisers, and college students. For those up for the challenge, all entries must be an original and inspiring idea, relevant to its context, well executed, and entries must have been published or displayed for the first time between September 1, 2015 and September 2017. The 2017 jury will be composed of distinguished luminaries from the advertising, publishing, media and creative industries. Deadline of entries on October 6. 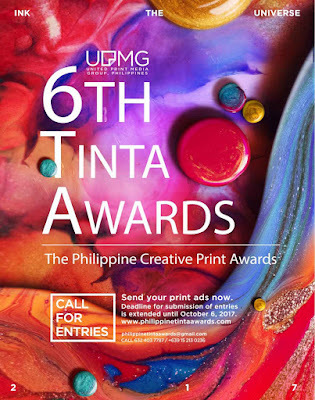 For more information, visit www.philippinetintaawards.com, call the UPMG Tinta Awards Secretariat at 403-7787 or email philippinetintaawards@gmail.com.